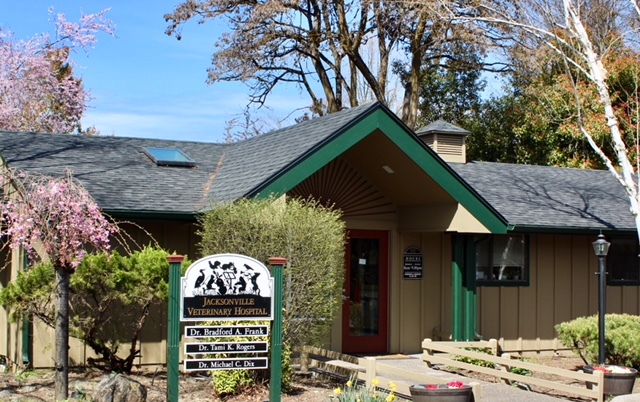 The Jacksonville Veterinary Hospital is a full-service veterinary medical facility located in Jacksonville, Oregon, serving families in Medford, Ashland, Central Point, and throughout the Rogue Valley. Since 1985 Jacksonville Veterinary Hospital has cared for thousands of pets, helping to keep them healthy and happy while providing education and support to their human companions. In addition to preventative and well-pet care, we perform dental, soft tissue and orthopedic procedures. Experience, compassion and interests in specialty medicine have made Jacksonville Veterinary Hospital one of the premier pet clinics in the Medford area. We welcome the opportunity to get to know you and your animals! Please give us a call to learn more about our veterinary practice and how Jacksonville Veterinary Hospital can serve the needs of you and your cherished pet. Senior Wellness and Dental Care Packages! - The girls after their spa's. - I everyone. I'm the Nubie! - The Princess in all her "Royalty"
- I'm ready to put out the fire! - Ward (PC Award Winning) Our beautiful ex racer and blood donor is greatly missed. He was a very special member of our family.